- EA Champions Cup Winter 2018 will be held at Nexon Arena in Seoul, South Korea (Group draw, Player Draft and Group Stage) and BEXCO Auditorium, Busan, South Korea (Knockout Stage) from November 8th to November 17th. 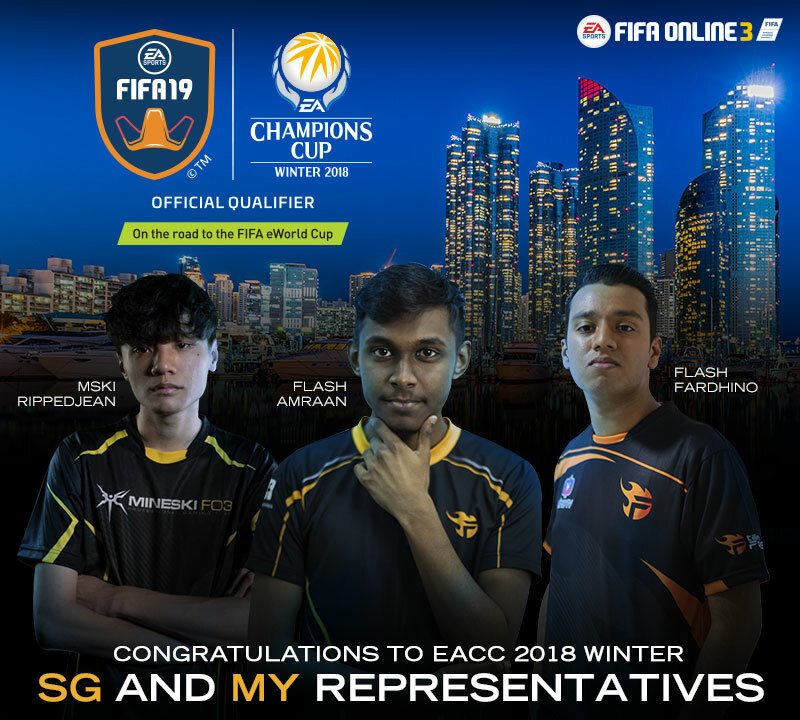 - EA Champions Cup Winter 2018 is the biggest e-Sports tournament for EA SPORTS FIFA ONLINE, an online football game developed by EA Korea and serviced by Garena. - EA Champions Cup Winter 2018 is an Official Qualifying Event for the EA SPORTS FIFA Global Series on the Road to the FIFA eWorld Cup 2019. EA Champions Cup Winter 2018, the biggest e-Sports tournament for EA SPORTS™ FIFA ONLINE- an online soccer game developed by EA Korea and serviced by Garena - will start with Group seed draw and Player Draft on November 8th and Group Stage from November 10th to 12th at the Nexon Arena, Seoul, and will continue to Knockout Stage on from November 16th to 17th at BEXCO Auditorium, Busan. EA Champions Cup Winter 2018 will consist of 12 teams representing 7 countries (Korea and China will have 3 teams each, Thailand and Vietnam will have 2 teams each, Singapore and Malaysia will be represented by 1 team, Indonesia will also have 1 team) who will compete to become the top EA SPORTS™ FIFA ONLINE team at EA Champions Cup Winter 2018, which offers a total prize pool of $240,000 USD. The top 8 players who will earn the most accumulated Pro Points across EACC Winter 2018 and EACC Spring 2019 will be eligible to compete in the EA SPORTS FIFA Global Series Playoffs on the Road to the FIFA eWorld Cup Final 2019 where the winner will be crowned the undisputed world champion of FIFA. The Pro Points system details will be released soon. More details of EA Champions Cup Winter 2018, including match format, event schedule, player profile and other information will be released in later.